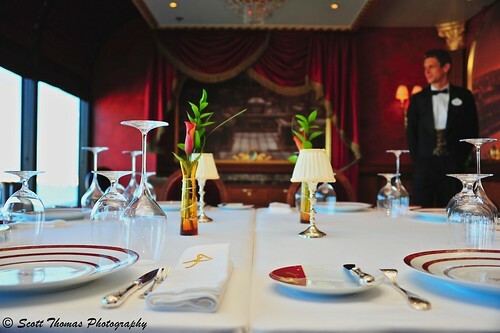 During the Christening Cruise for the Disney Dream, the upscale restaurant, Remy, was open for tours. A nice young man from France (seen in photo) was kind enough to take me into the private chef’s table room. He proudly showed the scenes from the animated movie, Ratatouille, on the inside walls surrounding the table. The table settings immaculate in their color and simplicity. The soft focused print behind the red curtains is of Gusteau’s kitchen from the movie. If you decide to enjoy a meal at Remy’s during your cruise, come hungry for the seven course meal which takes over three hours to complete. If you are interested in a Disney Cruise or vacation at Walt Disney World, click the link to request a non-obligation quote from Dreams Unlimited Travel and select Merrie Thomas (my wife) to be your agent. This entry was posted in Travel and tagged 28-300mm, cast member, disney cruise line, dream, flickr, nikon D700, remy, restaurant, server, thursday, vr, walt disney world. Bookmark the permalink. Isa, I really was happy with this photo. The young server was patiently waiting for me to finish as he wanted to show me some of the other scenes on the wall. He was so proud of the place. I just popped over here to see your Friday post and was so surprised to see a Thursday post! Lovely photo – and I’m sure it would be an unbelievable meal. Does Merrie book other types of vacations other than Disney? Yep, it is very easy to create a blog entry from flickr so I thought I’d add another day. I can schedule them in advance, too. She only does Disney now. She used to own a travel agency that did it all but it wasn’t very viable after the airlines stopped paying commissions. Most agencies today make their living on travel packages through tours and cruises as those companies still pay commissions as does Disney. I’ve never seen a table setting photographed like this before. Scott, you’ve made it look like a landscape. Thanks, Amy! This is a child’s prospective and, with the server in the background, really came out great. This image is absolutely gorgeous, love the composition with the young man in the background, he looks like a waiter.